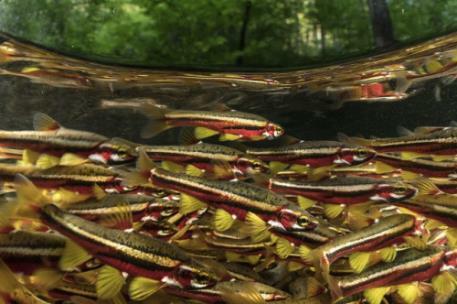 The brilliant yellow and red spawning colors of the Tennessee Dace contrast against the lush green forests surrounding a small stream in the Cherokee National Forest. 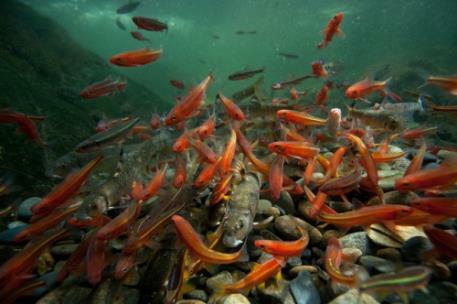 A cloud of colorful Tennessee and Warpaint Shiners surrounds the gravel mound nest of a River Chub, which serves as a desirable spawning site for many other minnow species, including the Central Stoneroller (larger fish in center with white spikes). Smoky Mountain National Park. 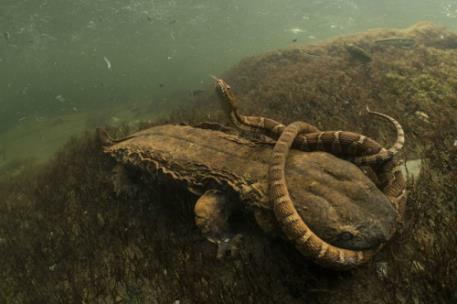 An Eastern Hellbender Salamander wrestles with a Northern Watersnake - a battle between two fierce predators in Southern Appalachian Rivers. Cherokee National Forest. A group of spawning Lake Sturgeon congregate in Wisconsin's Wolf River, where US Fish & Wildlife biologists gather eggs every spring to support sturgeon reintroduction efforts on the Tennessee River. On April 4, the Tennessee Aquarium IMAX 3D Theater will premiere a documentary, Hidden Rivers of Southern Appalachia. 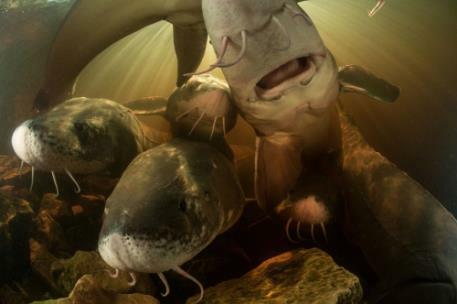 In 2011, Freshwaters Illustrated began working on Hidden Rivers — the studio’s third feature film — with the aim of documenting the unseen beauty of animals living in Appalachian waters. After almost a decade of biannual visits to the region for shoots lasting six weeks or more, the filmmakers have captured scenes "packed with vividly colored animals and fascinating behaviors witnessed by few outside the conservation and scientific communities." “Even on a global scale, Southeastern rivers are just incredibly full of life, diversity and amazing behaviors,” says Freshwaters Illustrated Director Jeremy Monroe. "On Chattanooga’s largest screen, audiences will witness many unforgettable moments, including neon-bright spawning fishes, minnows who meticulously construct nests from pebbles, and sneaky mussels who lure fish in close enough to immobilize them and force them to serve as caretakers for their larvae," officials said. "By showing audiences these scenes of unexpected beauty and resourcefulness, Hidden Rivers aims to inspire not only awe for the Southeast’s aquatic diversity but also a sense of responsibility to safeguard it." "Helping people to understand their connection to aquatic environments and to the animals that call those waters home has been at the core of the Tennessee Aquarium’s mission since it opened in 1992," officials said. "In general, most Southeasterners haven’t been directly exposed to the region’s abundance of underwater life. That lack of personal experience can be an obstacle to inspiring a conservation mindset, but films like Hidden Rivers help close the gap by offering a window into a world that otherwise would remain largely unseen." “When I was young, I thought that I could only study beautiful, colorful fish by swimming in coral reefs or by heading to the Amazon,” says Dr. Anna George, the Aquarium’s vice president for conservation science and education. “What I didn’t realize was how many beautiful, incredible fish we have right here in the Southeast. To celebrate the debut of Hidden Rivers, the IMAX 3D Theater will host a “one-time only” premiere event sponsored by TVA on Thursday, April 4. The evening, in support of freshwater science and conservation, will begin with a reception in the theater lobby at 6 p.m., followed by the screening at 7 p.m. and a post-film discussion with the film’s producer. Tickets are $20 for Aquarium members, $25 for nonmembers and include the screening, a drink ticket and light appetizers. Register online.